Scratch My Blog — every good dog deserves a great tag. 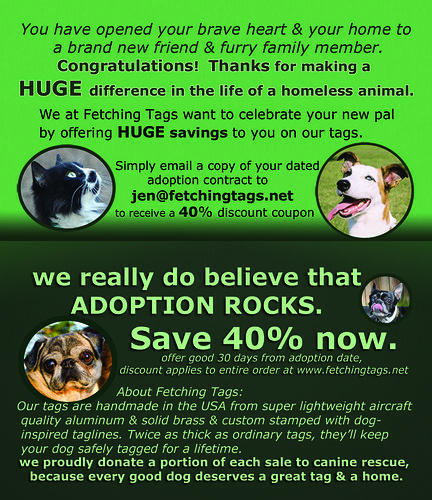 Here’s the inside of our new card for shelters & rescues! It’s easy to get the discount – just snap a clear photo of your dated adoption contract with your phone & send it our way – discount good for 30 days from adoption date. Want some cards to give away at your rescue or adoption events? 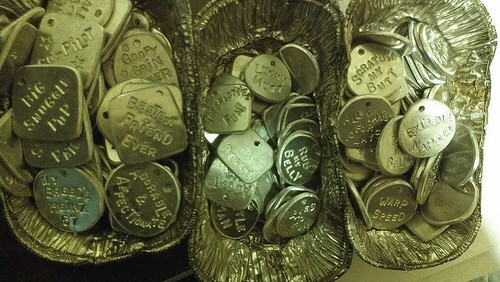 Just email jen at fetchingtags.net with your mailing address & we will send some your way. . . I want to talk to you about AAT(animal assisted therapy) and encourage you to get interested, get involved, or encourage others to try it out. 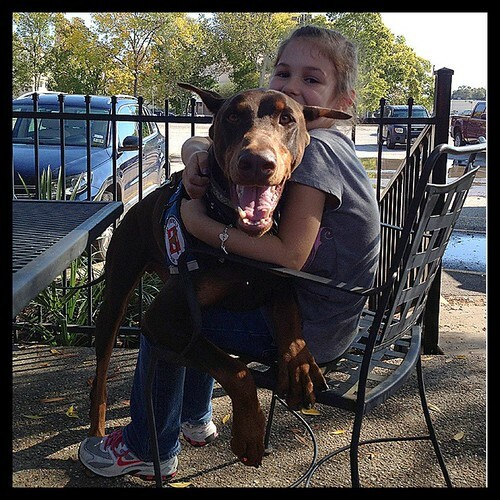 Therapy animals offer people security, forgiveness, companionship, unconditional love, and comfort. 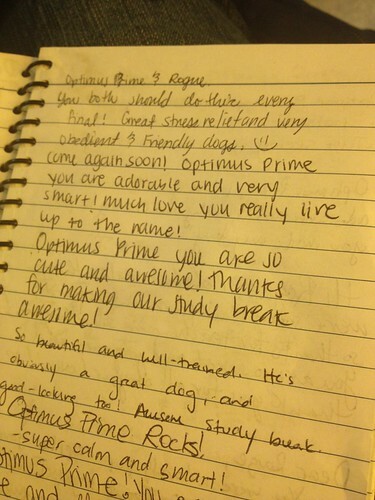 AAT does not involve just any pet interacting with a patient. 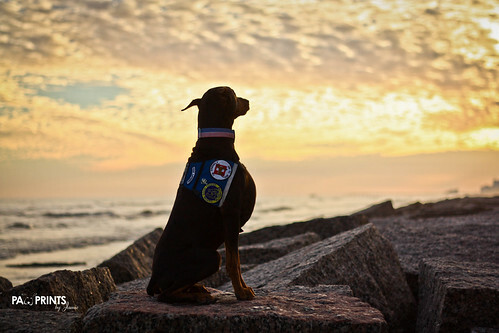 The volunteer and pet must meet certain training and behavioral requirements to ensure a safe and positive environment and experience for the patient. Canine Good Citizen testing is usually the first step. 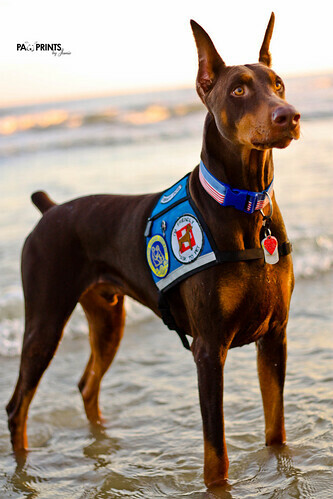 Therapy animals that have been appropriately trained are well socialized to all types of people, other animals, and medical equipment/environments. Dogs are the most common visiting therapy animals, but cats, small animals, and horses can be used as long as they have been properly trained and screened. Therapy animals can improve patient skills or help them learn new ones. Petting or grooming a therapy animal can aid in patient rehabilitation Getting a patient to write or talk about therapy animals or their past pets encourages cognitive and communication development. It has been proven over and over that including an animal in the life or therapy of a patient can make a considerable difference in the patient’s progress, recover, and comfort. My name is Jamie Fincher. I am 26 years old and a full time student at the Veterinary Technician Institute. 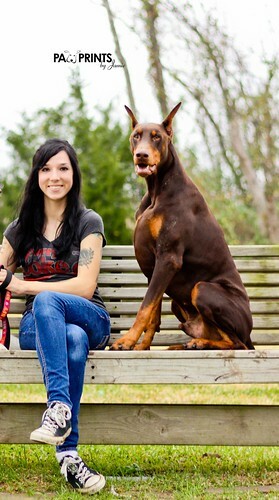 In addition to pet therapy, I have also been a long time volunteer in Doberman and German Shepherd rescue and train my Doberman in Agility and Schutzhund. I became interested in AAT many years ago when my grandmother went into assisted living. 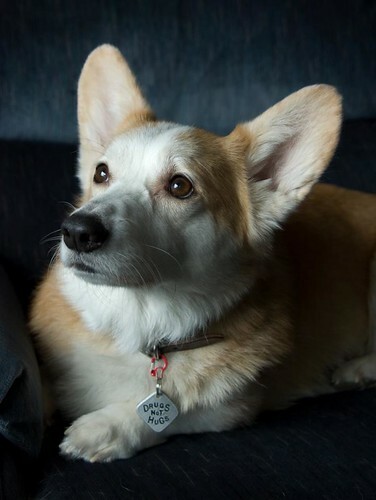 I had heard about therapy dogs and how much they helped people in those situations. I knew one day I wanted to have a therapy dog and be part of a dog and human team that helped make a positive difference in someone’s life. 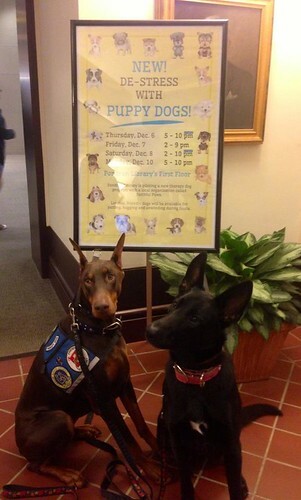 I am now the proud owner of two therapy dogs; My Doberman Pinscher, Optimus Prime, a former show dog, became certified through a local organization Faithful Paws in September 2012 and my German Shepherd, Rogue, a rescue dog, became certified in November. To get involved, there are a couple of national organizations you can become a member of. Pet Partners and Therapy Dogs International. Each of these have their own set of requirements. Being part of a therapy dog team is very rewarding and is one of the ways I can give back to society while also enriching my dogs’ lives. It is amazing how simply having my dogs give a patient a high five, or just being in their presence, can evoke such strong and happy emotions and can be the hi-light of someone’s day. My favorite place to visit is a Children’s Center that houses foster children of all ages. Many of the kids there have had negative and painful experiences with the breeds I own, some have shown me scars on their face from dog attacks. Being able to show them great ambassadors of these “dangerous” and stereotyped breeds is an incredible thing. My dogs love entertaining the children and they get to experience what well-raised, loved, and trained examples of these breeds are like and the great things one can accomplish with them. 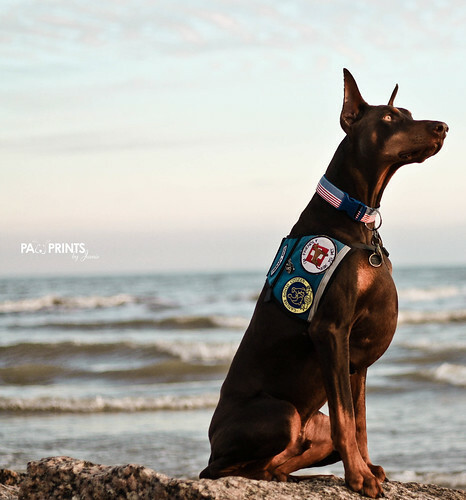 Canine Good Citizen and Therapy Pet certification can also make it easier on renters because many of us know how difficult it is to rent apartments and homes with certain types of breeds. I get stopped everywhere I go with my dogs in their vests with friendly patches on them. People are much more relaxed about approaching them and it usually generates many questions and interest into therapy animal programs. She is a 2.5 yr old South Georgia Farm dog rescue, a mama’s girl who is perfectly happy sniffing the air and watching the world go by. This is “Sentinel Bhindi” and her protege “Officer Bubba”. He lives down the street and Is just over a year old and barks after every squirrel in the ‘hood, issuing tickets and keeping the peace. 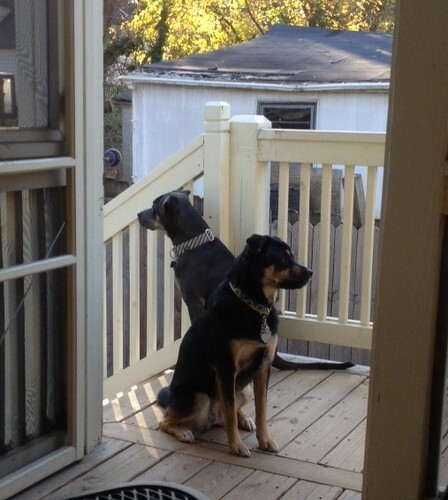 Bhindi sits on the stoop and supervises. 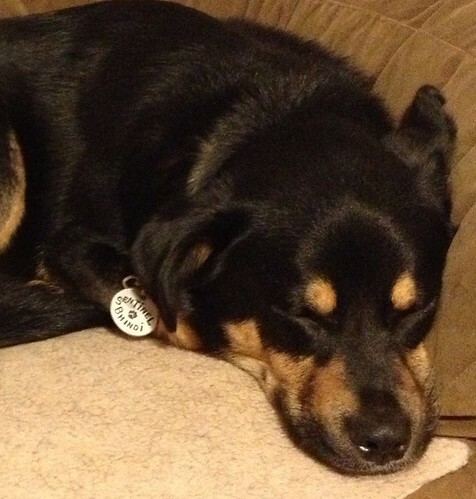 And generally takes the ” collar” from Bubba. It’s a tight precinct around here. Frodo has anxiety issues and doesn’t always like to be touched by strangers, but with help from a veterinary behaviorist and some behavioral medication, he is doing great!